Mount Rainier National Park is a United States National Park located in southeast Pierce County and northeast Lewis County in Washington state. 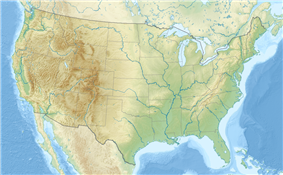 It was established on March 2, 1899 as the fifth national park in the United States. The park encompasses 236,381 acres (369.35 sq mi; 956.60 km2) including all of Mount Rainier, a 14,411-foot (4,392 m) stratovolcano. The mountain rises abruptly from the surrounding land with elevations in the park ranging from 1,600 feet to over 14,000 feet (490 - 4,300 m). The highest point in the Cascade Range, around it are valleys, waterfalls, subalpine meadows, old-growth forest and more than 25 glaciers. The volcano is often shrouded in clouds that dump enormous amounts of rain and snow on the peak every year and hide it from the crowds that head to the park on weekends. Mount Rainier is circled by the Wonderland Trail and is covered by several glaciers and snowfields totaling some 35 square miles (91 km2). Carbon Glacier is the largest glacier by volume in the contiguous United States, while Emmons Glacier is the largest glacier by area. About 1.8 million people visit Mount Rainier National Park each year. Mount Rainier is a popular peak for mountaineering with some 10,000 attempts per year with approximately 50% making it to the summit. The park contains outstanding subalpine meadows and 91,000 acres (37,000 ha) of old growth forests. Mt. Rainier National Park view. Ohanapecosh Park is one of many named subalpine areas that may be reached via the Wonderland Trail. Ninety-seven percent of the park is preserved as wilderness under the National Wilderness Preservation System, including Clearwater Wilderness and Mount Rainier Wilderness, a designation it received in 1988. It is abutted by the Tatoosh Wilderness. The park was designated a National Historic Landmark on 18 February 1997 as a showcase for the National Park Service Rustic style architecture (or parkitecture) of the 1920s and 1930s, exemplified by the Paradise Inn and a masterpiece of early NPS master planning. As an Historic Landmark district, the park was administratively listed on the National Register of Historic Places. In January 1, 2012 Park Ranger Margaret Anderson was shot dead while stopping a vehicle. The suspected assailant Benjamin Colton Barnes fled and hid in the park, prompting the authorities to close the park and launch a manhunt. Barnes' body was found the following day. The earliest evidence of human activity in the area which is now Mount Rainier National Park is a projectile point dated to circa 4,000-5,800 BP (before present) found along Bench Lake Trail (the first section of Snow Lake Trail). On March 2, 1899, President William McKinley signed a bill passed by Congress authorizing the creation of Mount Rainier National Park, the nation's fifth national park. It was the first national park created from a national forest. The Pacific Forest Reserve had been created in 1893 and included Mount Rainier. 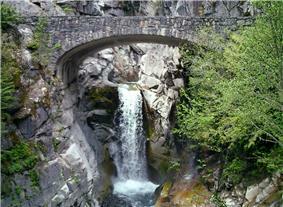 It was enlarged in 1897 and renamed Mount Rainier Forest Reserve. 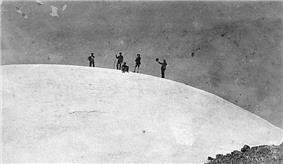 John Muir had visited Mount Rainier in 1888. Muir and nine others, including Edward Sturgis Ingraham, Charles Piper, and P. B. Van Trump, climbed to the summit in what became the fifth recorded ascent. The trip to Mount Rainier had played a role in reinvigorating Muir and convincing him to rededicate his life to the preservation of nature as national parks. At the time national forests, called forest reserves at first, were being created throughout the American West, under the utilitarian "conservation-through-use" view of Gifford Pinchot. Muir was what came to be known as a "preservationist". He wanted nature preserved under the more protected status of national parks. But during the 1890s there was more public support for creating national forests than national parks. During that decade, Muir and his supporters were only able to protect one national forest as a national park. When the Pacific Forest Reserve was created in 1893, Muir quickly persuaded the newly formed Sierra Club to support a movement to protect Rainier as a national park. Other groups soon joined, such as the National Geographic Society and scientific associations wanting Mount Rainier preserved as a place to study volcanism and glaciology. Commercial leaders in Tacoma and Seattle were also in support, as was the Northern Pacific Railway. The effort lasted over five years and involved six different attempts to push a bill through Congress. Congress eventually agreed, but only after acquiring assurances that none of the new park was suitable for farming or mining and that no federal appropriations would be necessary for its management. Mount Rainier National Park closed because of extensive flooding as a result of the 6 November 2006 Pineapple Express rainstorm when 18 inches (460 mm) of rain fell in a 36-hour period. Campsites and roads throughout the park were washed away. Power to Paradise and Longmire was disrupted. 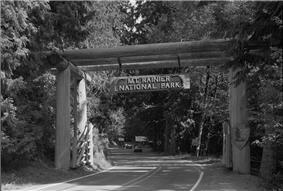 On 5 May 2007, the park reopened to automobile traffic via State Route 706 at the Nisqually Entrance. View of the south face of Mount Rainier from Skyline Trail, a hiking trail in Paradise. () is a visitor center in Mount Rainier National Park, located 6.5 miles (10.5 km) east of the Nisqually Entrance. The area is in the Nisqually River valley at an elevation of 2,761 feet (842 m) between The Ramparts Ridge and the Tatoosh Range. Longmire is surrounded by old-growth Douglas fir, western red cedar and western hemlock. Sunrise () is a lodge and visitor center located in the northeastern part of the park. At an elevation of 6,400 feet (1,950 m), it is the highest point in the park that is accessible by vehicle. There are miles of trails located all around Sunrise, such as Mount Fremont and Sourdough Ridge. The lodge is reachable via a 10-mile (16 km) turnoff from SR 410 near the White River entrance. Christine Falls, one of many waterfalls visible from a short walk from the main road. Ohanapecosh is a campground (with 188 individual sites and 2 group sites, open from late May through late September), visitor center (closed during the 2013 season), and ranger station located in the southeastern portion of the park, approximately 3 miles (4.8 km) from the park boundary off Highway 123. Located in a deep valley among old growth forest at an elevation below 2,000 feet (610 m), it is the only developed area of the park without a view of Mount Rainier. The Ohanapecosh Hot Springs, Grove of the Patriarchs, and Silver Falls are all located in the Ohanapecosh area. ^ "NPS Annual Recreation Visits Report". National Park Service. Retrieved 2012-03-07. ^ a b Mount Rainier National Park (Map) (Centennial ed.). 1:30,000. Cartography by Charles B. Kitterman/Kulshan Cartographic Services. Stanley Maps. 2000. ^ Bolsinger, Charles L.; Waddell, Karen L. (1993). Area of old-growth forests in California, Oregon, and Washington (PDF). ^ "Mount Rainier National Park". National Historic Landmark summary listing. National Park Service. Retrieved 2008-06-26. ^ "Manhunt in Mount Rainier park after US ranger shot dead". ^ Gast, Phil; Pearson, Michael (3 January 2012). "Troubled picture emerges of ranger killing suspect". CNN. Retrieved 2014-02-15. ^ a b c "Part One: The Cultural Setting. I. Historical Overview Of Indians And Mount Rainier". Mount Rainier Administrative History. ^ a b c Duncan, Dayton; Burns, Ken (2009). The National Parks: America's Best Idea. Random House. pp. 48–51, 84–86. ^ Carson, Rob; Hill, Craig. "Rainier Timeline". The News Tribune. Retrieved 24 July 2010. ^ """Transcribed from "John Muir's Ascent of Mt. Rainier. University of Washington. Retrieved 24 July 2010. ^ Carlton Harrell, Debera (5 May 2007). "Battered Mt. Rainier to reopen". ^ "National Register of Historic Places Nomination Form: Historic Resources of Mount Rainier National Park MPS" (PDF). National Park Service. Retrieved 7 April 2011. ^ Mount Rainier East, Washington (Map). 1 : 24,000. 7,5 Minute Series (Topographic). Coordinate measured using National Geographic TOPO! Software Version 3.4.3. ^ Pitcher, Don (12 June 2002). Moon Handbooks Washington. Moon Handbooks (7th ed.). Avalon Travel Publishing. pp. 615–616. ^ Barnes, Christine; Pfulghoft, Fred (Photographer); Morris, David (Photographer) (April 2002). Great Lodges of the National Parks: The Companion Book to the PBS Television Series. W W West. pp. 48–57. ^ Doughton, Sandi (10 October 2008). "Paradise rediscovered — new Mount Rainier visitor center opens". Seattle Times website (Seattle Times). Retrieved 2009-07-27. The new visitor center, at the park's premier destination, opens today. ^ "Mt. Baker Holds Snowfall Record, NOAA reports". NOAA. 2 August 1999. Retrieved 2011-09-16. ^ "WA Rainier Paradise RS". ^ Filley, Bette (2002). Discovering the Wonders of the Wonderland Trail: Encircling Mount Rainier (5th edition). Dunamis House. p. 37. ^ Scott, Kay W.; Scott, David L. (February 2002). The Complete Guide to the National Park Lodges, 3rd. Globe Pequot. pp. 193 ¬ 194.